You can now register for our Spring and Summer 2013 programs. Go to our registration page to register. Click here. We offer excellent conditioning and instructional programs to prepare your son or daughter for the upcoming hockey season. This is provided by our experienced instructors. We have an array of such programs. Click here to find a suitable program for your child. Welcome to the Canadian Hockey Academy Residential Hockey Camp. We have been involved in overnight hockey camps for over 20 years in both Canada and the USA. We offer an array of hockey instruction enjoyed by children from all over the world. The camp provides far more than hockey instruction. Each participant is exposed to a multitude array of activities to enhance personal growth, friendship, individual challenge and improved self-confidence. Our camp prides itself in its ability to offer an enjoyable and safe environment. We at the Canadian Hockey Academy are proud of its fine reputation. Much of this comes from the extensive experience of its staff. Our camp director along with the on-ice and off-ice coordinator strive to make your child's overnight camp experience as memorable as possible. We are excited to host, for our 5th year, our residential hockey camp just south of Canada's Capital Region. Our overnight camp will be held at Kemptville College which is approximately 30 minutes south of Ottawa. Our residential hockey camp is open to males and females aged 8 - 17 years. Each player/goalie at camp will receive 20 hours of on-ice instruction along with a combination of off-ice instruction and nightly scheduled activities. The on-ice instruction will take place at the brand new Kemptville Arena while most of the off-ice activities will take place at the College itself. Kemptville College boasts state of the art facilities. Each child will be housed in semi-private rooms. Each dorm floor boasts common areas which are well stocked with recreational amenities. Meals will be prepared by the professional staff of the College. Each participant will receive 3 meals daily along with nightly snacks. Participants will enjoy the vast array of daily foods that will be available to all. Special meal considerations can be made with the camp director. 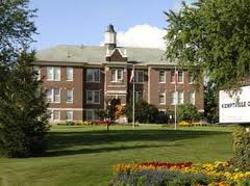 The general campus of Kemptville College boasts an array of sports fields along with a large gymnasium. Participants will also enjoy the local indoor pool along with the state of the art rink facilities and public theatre. Each player will receive 20 hours of on-ice instruction. Approximately 1/3 of the on-ice instruction will focus on skating development. Another 1/3 will be spent on puck skills. Players will undergo an extensive puck handling skills training. The final 1/3 of the on-ice program will be spent towards improving the other aspects important to the hockey player. This includes body contact, offensive and defensive skills and team development skills. At the end of camp each student will receive a detailed evaluation report. The off-ice component will include strength training, classroom lectures, aerobic/anaerobic training and sport development programs. Our professional staff will be attending to your child's needs during his/her entire stay with us. Our staff will be comprised of mature adults with extensive experience. Most staff are comprised of professional educators. The on-ice staff have extensive hockey instructional experience. Our head on-ice instructor along with his associates will be introduced closer to the start of camp. Each participant will be kept quite busy during their stay at camp. Apart from the 20 hours of on-ice instruction each player will participate in many activities that will challenge them both physically and mentally. The College will also plan an array of recreational activities such as camp fires, go-carts, bowling before hockey games, farm tour, theatre etc. All students arrive on Sunday afternoon and depart Friday at the end of camp. Shuttles to and from the Ottawa Airport can be arranged for a minimal fee. See Program Dates and the left menu link Canadian Camps for dates, locations and tuition fees and to register. The Registration "Test Page" is not currently available. The Canadian Hockey Academy will be once again hosting its 4 on 4 league in the Orleans area during the months from April to June. Click here for more information.